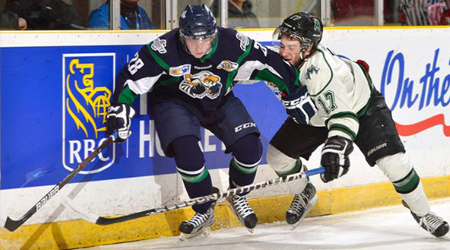 The Surrey Eagles improved to 3-0 at the RBC Cup with a 5-0 shutout victory over the SIJHL's Minnesota Wilderness. Trevor Cameron was named Surrey's player of the game after picking up a goal and an assist while Michael Santaguida made 29 saves for his second goose-egg of the tournament. Santaguida becomes the first goaltender to post two shutouts in an RBC round-robin since Peter Wishloff achieved the feat while playing for the Eagles in 1998. Surrey out shot the Wilderness 19-8 in the opening frame, and the Birds found the net after the midway mark when Nic Pierog fired a shot past Minnesota goalie JoJo Jeanetta from the right circle. Trevor Cameron added his name to the score sheet with less than 90 seconds to go in the period after Demico Hannoun forced a turnover at the Minnesota blue line and passed to Adam Tambellini who quickly dished the puck to Cameron for a tap-in at the left post. Drew Best made it 3-0 at 11:20 of the second with a nice shot that found the top corner on the short side from in close at the bottom of the right circle. Surrey struck again in the final minute of the period after Wilderness defenceman Benjamin Michaud took a penalty with 10 seconds left, and Michael Stenerson scored before the end of the stanza when he tipped a Devon Toews point shot past Jeanetta with only four seconds remaining. The Birds shut it down in the third and played a very defensive 20 minutes, keeping the Minnesota forwards at bay, save for a couple of goal-mouth scrambles. Kevan Kilistoff rippled the mesh off the rush in the late stages after Cameron found him with a nice pass on a three-on-two to complete the 5-0 victory for Surrey. Surrey's power play struck once on seven opportunities in the game while Minnesota was 0-for-6. The Eagles finished ahead on the shot clock 36-29. As a result of the loss, the Wilderness will finish fourth in the round robin and will face the first place team on Semi-Final Saturday. Meanwhile, the Birds hold their destiny in their own hands as they can finish first with a victory in their final round robin game against Brooks on Thursday. Face-off at 11am PT/3pm AT.